Conveniently located off Highway 41 between San Francisco and Los Angeles, this Ramada Fresno North hotel is near Fresno State University, Fresno Yosemite International Airport, restaurants and boutiques at Tower District, thrilling rides at Wild Water Adventure Park, and hiking at Mono Hot Springs. Take a short drive and explore the natural beauty of Yosemite National Park. Refresh at this hotel with complimentary wireless Internet, fitness center, pool, room service, large-vehicle parking, meeting space and business center. Guest room amenities include microwave and refrigerator upon request. 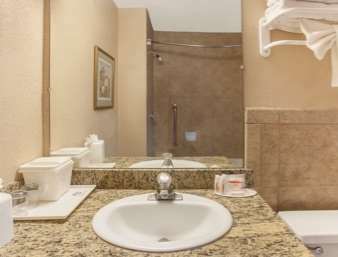 Suites, smoke-free and handicapped-accessible rooms are also available. There is no charge for children 17 and under with an adult.